Chicago – July 5, 2014 – Recently, Canada’s best union for private sector workers helped contribute to the launch of the UFCW Gold Internship Program — an intensive training course for UFCW activists in the United States. As part of this inaugural session, participants learned about UFCW Canada’s Youth Internship Program (YIP) — our union’s longstanding training and education program, which is geared exclusively to empowering young activists across Canada. A group of 36 member activists from across the United States are participating in the four-week program. 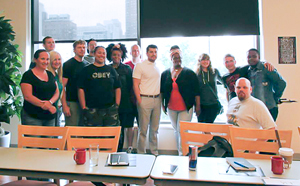 The first week of in-class training, which took place at the University Centre in downtown Chicago, focused on topics as diverse as organizing, immigration, politics, and youth engagement in the labour movement. The remaining three weeks are dedicated to direct involvement in ongoing UFCW campaigns. UFCW International invited UFCW Canada national representative Pablo Godoy to facilitate a workshop on our how our union successfully trains, educates and empowers young workers when they join the union. Brother Godoy brought greetings from young UFCW Canada members who participated in the most recent YIP training. Coordinators of the program in Chicago spoke of how the Gold Internship Program is itself inspired by YIP. “It was an honour and a great opportunity to participate and share with UFCW brothers and sisters in the Gold Internship Program,” says Brother Godoy, “It was an empowering experience, joined in solidarity across borders as UFCW activists to grow and strengthen our great union."